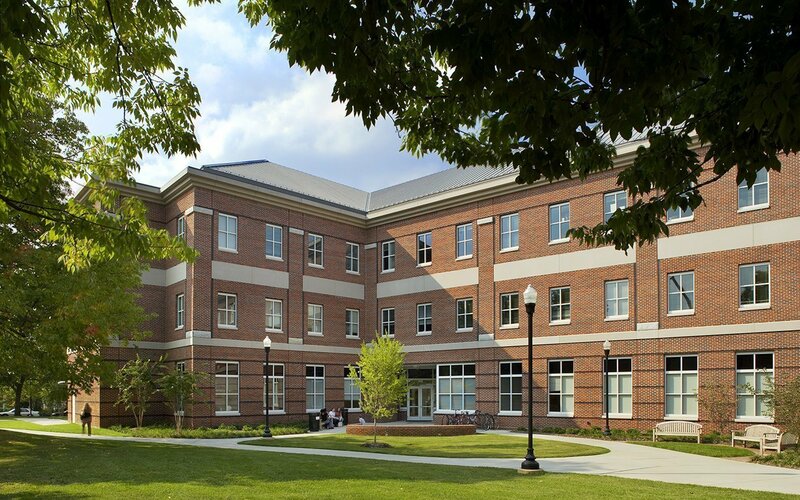 For the Moore Humanities & Research Administration Building (MHRA), UNC-Greensboro charged CJMW with designing a building to bring together five related academic departments – previously housed in various locations on campus – into one facility conducive to teaching, scholarly research and administrative functions. CJMW’s architects worked with individual departments to develop a program based on needs for different teaching/class types, then designed classrooms based on these needs. These range from intimate seminar rooms to tiered seating for larger classes. All classrooms, seminar rooms and conference rooms are equipped with state-of-the-art audiovisual and digital projection equipment. Rooms were designed with close attention to acoustics and lighting to facilitate both teaching and learning. 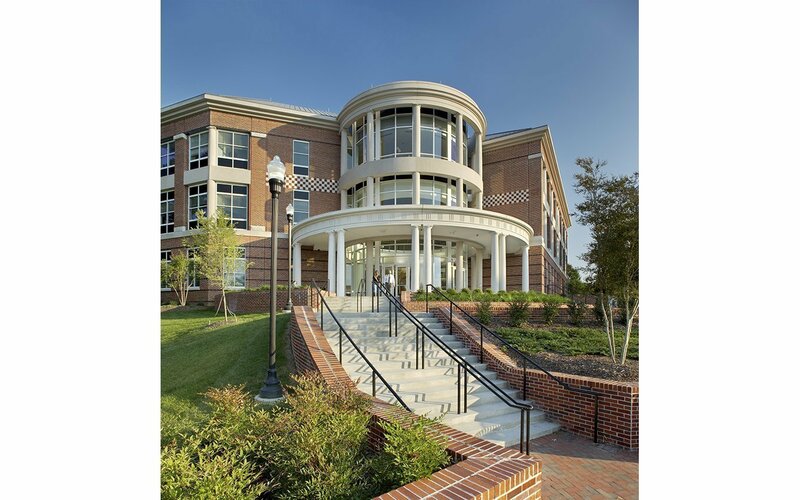 Sitting at the transition between campus and community, MHRA’s exterior translates the traditional materials and architectural style of UNCG’s historic campus into an updated aesthetic. 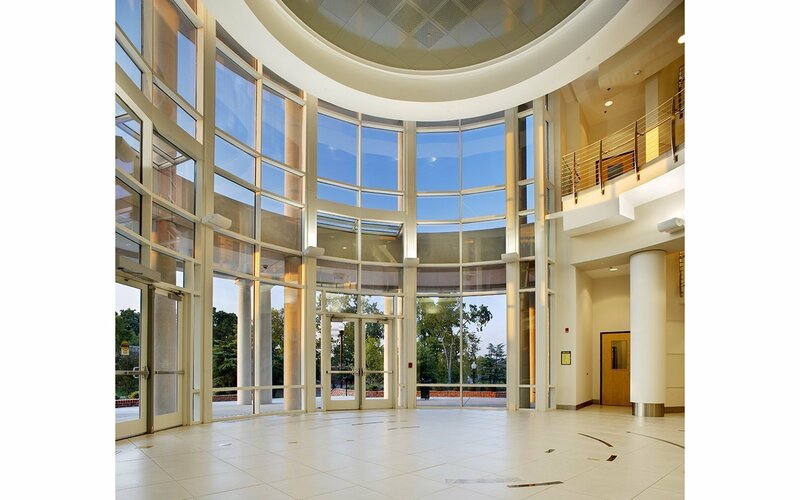 The entry is celebrated by a classically detailed rotunda that opens into a light-filled atrium. As one of the signature buildings on campus, Moore Hall plays an important role in attracting faculty, students and donor funding to the University. To support that function, UNCG requested a modern, corporate image for the building interior. 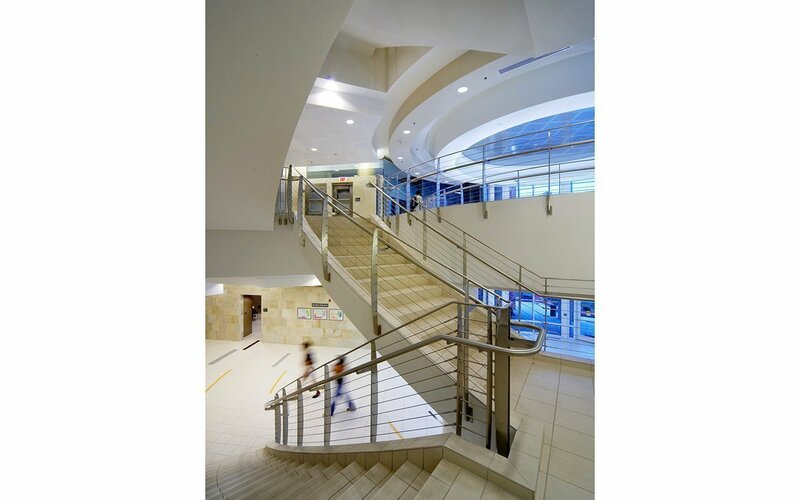 CJMW’s interior design team used high-tech materials such as perforated metal, glass, stainless steel and textured stone to mark important spaces and transitions between the exterior and interior, guiding visitors through the building. Hard-edged materials are juxtaposed with the light-colored sycamore used for the reception desk and columns in the reception area. Colors are a sophisticated palette of neutrals – off-white, gray, and beige – with bright yellow and red to accentuate details.